1. The 4 piece kit is offered in oil rubbed bronze finish for a classic black look. 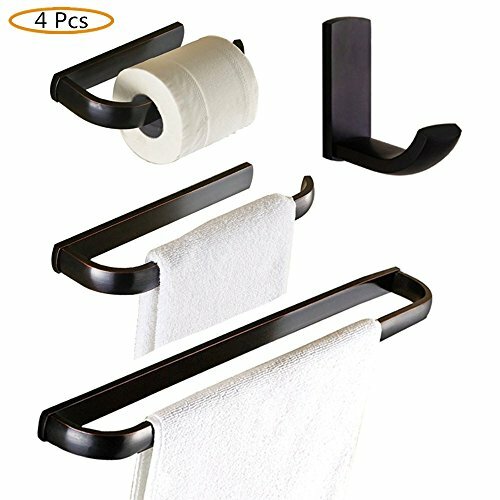 This kit includes a 22.6 inch towel bar, a square towel ring, a robe hook, and a toilet paper holder. 2. This kit has mass appeal with its clean presence in the bathroom. 3. Coordinates properly with each other of our WINCASE 4 piece set which provides a elegant look throughout the home. 4. Concealed screw mounting system makes your bathroom more beautiful. 5. Complete with wall mounting accessories and an easy installation with just several simple steps. Durable Materiel: High quality solid brass construction provides long-lasting durability and dependability. Elegant Unique Design: Modern black look and unique style brings the beauty of elegance and a modern look. It is also suitable for any style of bathroom decoration. Surface treated: Oil rubbed bronze finish makes it beautiful and glossy. The surface is smooth and delicate. Convenient Installation: All hardware required for installation is included. Easily mount our bathroom accessories on a variety of surfaces. Features: This 4 piece collection has a sleek appearance. The arc design of the end ensures safe using. If you have any questions about this product by WINCASE, contact us by completing and submitting the form below. If you are looking for a specif part number, please include it with your message.